By all accounts, Sporting Kansas City prepared for this about as well as it could have. It began planning for this CONCACAF Champions League just as soon as it knew it had qualified, back on Sept. 20 of 2017, a full year and a half before Thursday’s semifinal first leg in and against Monterrey. Sporting built its roster for this competition, adding depth wherever it could under Major League Soccer’s suffocating roster rules. And SKC invested in this competition in other ways. It flew charter flights to away games. It practiced in different places, seeking out altitude or similar climates while slogging its way through this grueling tournament. It managed to hammer Toluca 5-0 on aggregate in the round of 16, taking the rare win on Mexican soil. And then it came from behind to knock out Independiente of Panama in the quarterfinals. One of MLS’s most consistent and best-run clubs, coming fresh off a 7-1 spanking of the Montreal Impact no less, was as ready as it would ever be. To head coach Peter Vermes, this represented another opportunity to not only win glory for Kansas City, but to finally bring some catharsis to MLS, which has never produced a winner of this tournament in one frustrating season after another. Finally winning the CONCACAF Champions League for MLS has become something of an obsession in some circles. “It’s winning the competition; it’s putting ourselves into a place where we can be a part of the conversation, which we’re not currently,” Vermes told MLSsoccer.com. But it all mattered little. 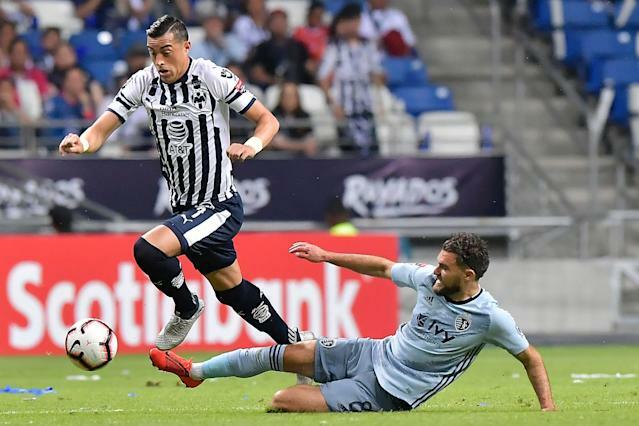 Monterrey ran roughshod over Sporting on Thursday, scoring twice in the opening quarter of an hour and running up the score in the second half. The 5-0 victory all but assures Monterrey’s place in the final, against either Tigres or Santos – likely Tigres, after its own 3-0 first leg win. Dorlan Pabon opened the scoring by darting through the SKC back line on a through-ball from Rogelio Funes Mori and finishing cleanly. Aviles Hurtado then pounced after an awkward scramble in front of the Kansas City goal. Jesus Gallardo later had a far-too-simple tap-in at the far post when Stefan Medina rolled a low ball across goal. Nico Sanchez converted a penalty after Hurtado was brought down in the Sporting box by Yohan Croizet. And Pabon smashed in the fifth as the Kansas City defense broke down yet again. Sporting simply wasn’t competitive. And a quick glance at the two teams’ finances is instructive here. Soccer is simple: You get what you pay for. And Monterrey pays a lot more than does Sporting, or any other MLS team. Not at the high end of its salary structure, perhaps. MLS teams tend to pay their superstars better than Mexico’s Liga MX teams. But the second and third tier of players is far better compensated south of the border, making an enormous difference in depth. Sporting Kansas City had a payroll of about $11.5 million last year – just about in the top half of MLS. Monterrey’s payroll isn’t public, but it’s widely believed to be at least three times SKC’s. If not four. Transfermarkt, the authoritative website on the player market, pegs Monterrey’s cumulative transfer market value at $92 million, the highest in Liga MX. Sporting’s is $24.4 million, in the middle of the pack of its league. Monterrey had a net expenditure of $41 million on transfer fees this season, including $15 million for Maximiliano Mesa, who didn’t even play on Thursday, and $16.5 million for Rodolfo Pizarro. Such sums are unimaginable to Sporting. It’s little wonder that Monterrey has been rolling over teams in Liga MX this year. But he, too, knew that the challenge was an enormous one. “We’ll have to be in good form to try to get any type of result against that team,” Vermes said. Three times, MLS teams have managed to reach the final of the CONCACAF Champions League, losing on every occasion. But the secret to finally winning this thing is an open one: allow MLS teams to spend whatever they want on their rosters. Or, at a minimum, raise the various spending caps to bring them closer to Liga MX juggernauts like Monterrey. Failing that, MLS isn’t actually all that serious about winning the continental title. And as such, it should probably stop talking about it.